We just received some homemade maple syrup from our neighbors. 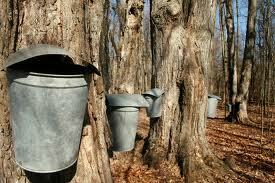 Did you know it takes 40 gallons of sap to make one gallon of maple syrup? Here in Michigan we produced 91,000 gallons of maple syrup this year. How much sap was tapped to make this syrup? This entry was posted in Uncategorized and tagged multiplication. Bookmark the permalink.